Both are ultra exclusive and expensive. They appeal to the rich and famous - including movie stars and business moguls. Both islands have pristine beaches, lush tropical landscapes, and spas - and are surrounded by coral reefs and clear turquoise waters. The weekly rate exceeds $250,000 for a party of up to its capacity (two dozen guests). Necker Island is owned and was developed by Virgin Atlantic Airways founder Sir Richard Branson. Balinese-style structures enrich the picturesque setting. Update: Sad to report, the main complex burnt down on August 22, 2011, the result of a lightning strike. Branson expects to rebuild it. One of his house guests, Oscar-winning Kate Winslet, helped save his 90-year-old mother. Your party of 24 will pay about $250,000 to have this gorgeous tropical island all to themselves. Musha Cay is the brainchild of celebrity illusionist David Copperfield. To be eligible for this select list, a resort must not only be superlative, it must also have exclusive use of its island. The left photo in my montage is copyrighted by Necker Island and the right photo is copyrighted by Sandy Lane. Both used with permission. 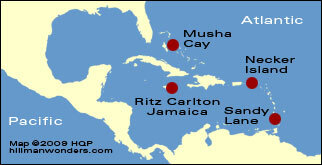 Geographically, the Bahamas as well as the Turks and Caicos are Atlantic, not Caribbean islands. They lie just beyond the Caribbean Sea. Because most travelers and the industry consider them Caribbean, I use that definition.